If you're searching for a small crustacean to share your life, a fiddler crab can fill the bill. These little crabs with the big claws aren't hard to keep, and make interesting watching. That's one reason they're a favorite classroom "pet." Caring for fiddler crabs consists primarily of feeding them and changing their water daily, with major habitat cleaning required every couple of months. Formally known as Uca pugilator, fiddler crabs received their nickname either because some folks believe their large claw looks like a fiddle, or because males waving the claw to attract females look like they're playing a fiddle. If you purchase young fiddler crabs, expect them to share your life for the next year-and-a-half. 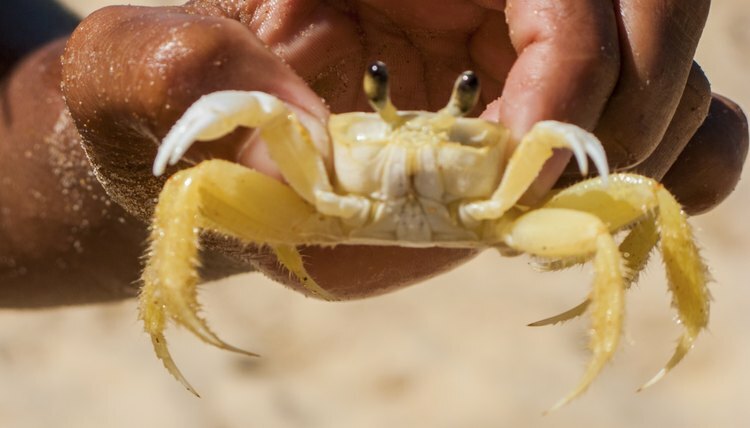 At maturity, these little crabs are only 1.5 inches long, minus the claw size. These Florida natives consume algae in the wild. Each fiddler crab needs about 1 square foot of space. Because they like climbing, keep the tank covered. Avoid putting the tank in direct sunlight, as excessive light can harm your crabs. Place approximately 2 inches of sand -- preferably sand straight from the beach -- in the bottom of the tank. Place a small bowl in the sand, ensuring the rim abuts the sand surface. Fill it halfway with dechlorinated water. Change the water every day, or whenever it's dirty, which could mean a few daily changes. Keep the tank temperature between 68 and 77 degrees Fahrenheit. Completely change the sand at least every two months. In nature, fiddler crabs subsist by scavenging on the beach for food. While pet stores might not sell food designed specifically for fiddler crabs, hermit crab food makes a good substitute. You also can give them small bits of fruits and vegetables. Place food in a shallow container, so the crabs can easily access it. Throw out uneaten food and replace it daily. It can take time for a fiddler crab to eat, as they consume meals by picking up small pieces of food and putting it in their mouths -- almost as if they savor every bite. If you keep felines, give your crabs some crushed dry cat food as treats. If your tank has sufficient space, you can keep several fiddler crabs together. While you can keep multiple males, it's best if you have one male and a few females. They're unlikely to breed in captivity. Female crabs are smaller, with smaller claws. Other compatible species can share your fiddler crabs' tank. These include newts, anoles, zebra snails and dwarf African frogs. You can put plants in the tank, but don't be surprised if the crabs damage them.